Mark Stapleton lives in Kilkenny, Ireland. Born in the UK in 1980. Mark was brought up in South Africa, moving back and forth from the UK and South Africa throughout his childhood. Marks training background is in Chinese Martial Arts having studied martial arts for the last 23 years, Mark has run a full time martial arts club in Kilkenny for the last 10 years (school of Chinese martial arts). And is chief European instructor for the Yiliquan martial arts association. Mark has travelled extensively throughout Europe, USA and China for training. Mark got involved in kettlebells in September 2008 by Qualifying as an extreme kettlebell fitness instructor in London UK. Learning methods of kettlebell use for fitness, this was similar to the kind of hard style training promoted by Pavel Tsatsouline. To begin with Mark was mainly interested in a quick, and efficient way of developing explosive power, and increasing all round body conditioning to supplement his martial arts training. Along with his training partner Eddie Sheehan , in 2009 they formed the KILKENNY KETTLEBELL CLUB, they provided kettlebell training to men and women a few times per week. In 2010 Mark became interested in kettlebell sports and started to do research on the training methods used by GS athletes, mark soon found that the "hard style" training programs and methods where not as efficient and or as effective as the methods being taught and trained in Russia by top GS athletes. In march 2010 as part of the Irish team, mark competed in the UK kettlebell open in London, he was still at a beginner level and only used 20kg kettlebells. At this competition mark met Gregor Sobocan and was able to witness first hand what correct kettlebell training can achieve. Mark and Eddie the head coaches of the Kilkenny kettlebell club quickly approached Gregor to coach them. Through online coaching and trips to Slovenia, they quickly progressed. In July 2010 Mark and Eddie hosted the first ever kettlebell sports championships in Ireland, and since then mark has competed in the Berlin kettlebell open and was proud to be one of two athletes (the other being eddie Sheehan) to be the first Irish athletes to represent Ireland competitively in an international competition at the IGSF world championships held in Milan, Italy. Mark achieved a result that gave him CMS rank under IGSF ranking system, this makes him and his training partner the only CMS level athletes in Ireland. Mark trains and coaches martial arts and kettlebells fulltime, in recent years mark has travelled throughout Ireland and UK teaching martial arts seminars and of recent has started to teach kettlebells to athletes from outside Ireland having a number of people travel to him from the UK to train. Mark is joint head coach of KILKENNY KETTLEBELL CLUB with Eddie Sheehan and of recent they have set up the IRISH KETTLEBELLTEAM. In 2011 Mark along with Eddie Sheehan and James Fennelly opened a full time training facility in Kilkenny, Ireland. There new training facility is called THE TRAINING ROOMS. Here they offer training in, kettlebell sports and fitness, martial arts, weight lifting, body building, strong man training, cave man training, circuit training, total body workouts, group and team training, personal one to one training. 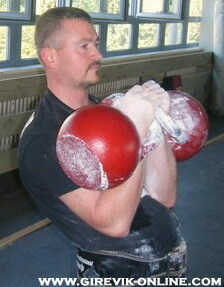 Mark competes in the 80kg or 75kg weight categories. In the future mark will be competing in Ireland at the EGSA long cycle competition in march and hopes to achieve his CMS level in long cycle. He will also compete in Rybinsk ,Russsia in the 32kg biathlon where he will try get near his MS rank. He will also compete in Irish kettlebell championships in biathlon where his goal will be Mater Of Sports. 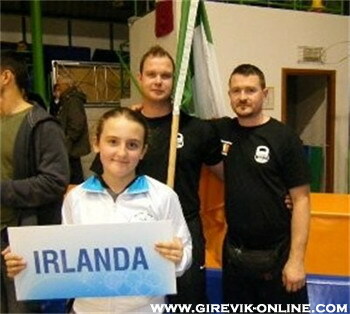 He will attend either the IGSF or IUKL Worlds championships in 2011 where he hopes that he will be bringing along a large Irish team. In the last year Mark and Eddie have been promoting true kettlebell training in Ireland, having written a number of articles and having done a number of radio interviews on the subject. Marks next goal is to teach young boys and girls kettlebells so that Ireland will not only have a strong kettlebell team in the future but they may benefit from the many great health benefits of such training.